The Old Foodie: Feeding the Farmhands. "Very busy all day with my Barley, did not dine till near 5 in the afternoon, my Harvest Men dined here today, gave them some Beef and some plumb Pudding and as much liquor as they would drink…"
In Herefordshire, another eighteenth century gentleman farmer called William Ellis wrote a farm management manual entitled “The Country Housewife’s Family Companion … ”, and devoted a considerable part of it to this very issue. There are headings such as “pork, pickled, its use in harvest”, “plumb pudding to make in harvest”, and “suet, to provide against harvest”. He outlines the harvest-catering exercise, and explains why it was so important to get it right. Of Victualling Harvest-men in Hertfordshire. IN this County we hire Harvest-men long before Harvest, by Way of Security, that we may not be at Loss for them when we most want them; and give each Man Thirty or Six and Thirty Shillings for his Month’s Service, besides victualling and lodging them in the House all that Time, for then they are ready early and late to do our Work. Now in victualling these Men there are Variety of Ways practiced by Country Housewives; and she that can do it cheapest, and most satisfactory, is the best Housewife. To this purpose, I, and many other Farmers, single out some of our oldest Ewes, that are what we call broken-mouth’s Sheep (that is to say, such who by Age have lost most of their Teeth before) and timely put them into good Grass, for their coming out fat enough to kill in Harvest. Or instead of Ewes, others kill a fat Barrow-hog of twenty or thirty Stone Weight (one or more) the Offald of which we eat fresh, and the rest we salt down, as is my Way every Harvest. …. Some beef we commonly take of him [the butcher] every Week during the Harvest, and Suet with each Lot or Parcel, for making Harvest-puddings, which is so necessary a Part of our Victuals, that the Men think they cannot make a good Dinner without either a Plain or a Plumb one … These with several other Preparations of Food, with strong Beer and Ale, are what we victual oru Month or Harvest Men with. .. In short, it is our Notion in Hertfordshire, that That Gentleman, Yeoman, or Farmer, manages best, who victuals his Harvest-men with Beef, Bacon, or pickled Pork, Beans, Pease, Puddings, Pyes, Pasties, Cheese, Milk, with other culinary Preparations, and with well-brew’s strong and small Beer and Ale; for such a one stands the best Chance of hiring the best Hands, that will go on briskly with their Work and do a good deal of it in a Day. Naturally the good Mr. Ellis gave some recipes for harvest fare. 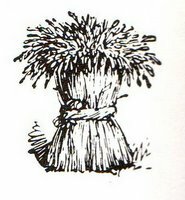 Of making Puddings with Wheat-Flower, in Harvest and at other Times in the Year. To make a Hertfordshire Seed-cake for Harvest-men. This cake is made much after the same Manner as Wigs are made, by stirring Flower, Yeast, Milk mix’d with some Cream, Sugar, and Carraway-seeds, which, after being kneaded and fermented, is baked in a round, deep, earthen or tin Pan, on a Hearth, or at the Oven’s Mouth, and serves for Beaver Victuals upon a Change; that is to say, it is sent into the Field about four of the Clock in the Afternoon with some Cheese, for the Harvest-men to eat this Cake dry with, or to dip it in Ale. I wish when I was a 20th century farmhand in Hertfordshire I wsa victualed thus. I suppose my labour wasn't hard or manual, running barley through the grain driers. Hello Ed. Lurid sweet and sour chicken and no liquor Huh? sometimes it seems we have gone backwards while we have been going forwards, doesn't it?